Incidents of Travel in Central America, Chiapas, and Yucatan, Vol. II. The year is 1838. The scene is the dense Honduran forest along the Copán River. Two men, John Lloyd Stephens and Frederick Catherwood, are about to rediscover Mayan civilization. Their guide, slashing through the rampant growth with his machete, leads them to a structure with steps up the side, shaped like a pyramid. Next they see a stone column, fourteen feet high, sculptured on the front with a portrait of a man, “solemn, stern and well fitted to excite terror,” covered on the sides with hieroglyphics, and with workmanship “equal to the finest monuments of the Egyptians.” Stephens records these discoveries and also his travels in Central America, where he had been sent by President Van Buren as special ambassador to the ill-fated Republic of Central America. The republic being engulfed in civil war when Stephens arrives in Guatemala, he finds himself dodging revolutionary armies while he hunts for a “legitimate government” to which to present his credentials. Catherwood, meanwhile, directs his immense artistic talent to illustrating views of Mayan architecture. 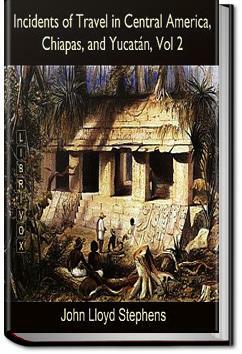 Incidents of Travel in Central America, Chiapas and Yucatan was a best seller in its day and has been called an “Indiana Jones” saga by modern reviewers. . . .I had it brought to the side of my hammock. My effort made him happy, and I began to think my prostration was merely the reaction from over-excitement; and by degrees what I began to please our host I continued for my own satisfaction. The troubles of my companions no longer disturbed me. My equanimity was perfectly restored, and, breakfast over, I set out to look at the ruins. Ever since our arrival in Yucatan we had received courtesies and civilities, but none more thorough than those bestowed by our host of Nohcacab. He had come out with the intention of passing a week with us, and the Indians and the whole rancho were at our service as long as we chose to remain. This books takes you to an amazing journey of discoveries in the the Yucatan Peninsula in the mid-19th century. A definite must for Maya enthusiasts. This is probably the book that gave birth to the studies of the Maya civilization. ame as the other one. This book is well written by an enthusiastic explorer.